I'm looking for hardware solutions to the two problems: keeping a tablet or smartphone temporarily but safely fixed in place, and also preventing a kid from activating its touchscreen or physical buttons. "Don't give a tablet to a baby, period." We get it. But video calls are the one exception, and they're important to us. Reasoning with or training the child. He's too young. For a few months it worked pretty well to just restrain him from reaching the device at all, but now he's old enough to see that as a battle of wills, and that's not how we want to use up our hard-won time-slots for transatlantic calls. At the same time he's not old enough to have fine control over where he grabs or to understand why he shouldn't grab. By contrast, if I could find a way to fix the tablet temporarily but securely to the bars of his play-pen, I think his initial frustration at not being able to move it would extinguish quite rapidly. Some things are just fixed, and he gets that. The "Guided Access" option on iOS. First, in recent versions of the OS, Apple have deliberately disabled it for FaceTime. Second, it's buggy, with a tendency to leave you trapped in Guided-Access mode with only forced-reset as an escape route. Third, it doesn't solve the problem of physically fixing the device. In fact, let's steer away from software-specific solutions altogether. Assume for the sake of argument that we want to contact multiple non-technical relatives, one of whom is comfortable with FaceTime, one of whom only uses Skype, one of whom uses Google Hangout, etc, and in all cases it's hopeless to try to teach them to use an unfamiliar app. I'm sure a solution can be built from scratch using $15 worth of materials from a DIY store, but I have very little natural skill in that direction, and in particular would have a hard time placing my faith in the child-safety of what I'd made. Can anyone think of ready-made or extremely-simple-to-build hacks? 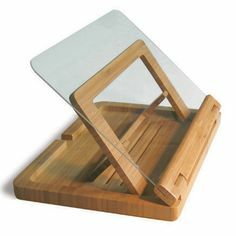 Try a cookbook stand with a clear plastic front. I use one to keep the pages of my cookbooks clean of food debris while cooking. That way you have a easily cleanable surface that won't affect your call between the tablet and the baby. That, or use a Chromecast to put the call on your TV screen. Here is an approach that might help out. Note: it may work better for a tablet than a phone. If you get a box, something like a cereal box thats a bit bigger than the tablet/phone. Cut out a section in the middle roughly the size of the screen. Then get 2 Styrofoam blocks like this and cut notches into it to put the tablet/phone in. One block should go on either side of the device, and they may need to be cut a bit to fit inside the box. Also you should probably use something like an ice pick or a pen to push a hole to where ever the speaker is to let sound out. Then use a piece of clear plastic to put over the screen. Preferably something stiff, so that touching the plastic will not cause the touch to register on the touch screen. To assemble place the device in the notches of the styrofoam and place the plastic on top. Then slide it into the box and tape it closed. All that should now be visible is the screen, but it will be protected from being touched by the plastic. Sound will still be produced (if it is muffled, make the speaker hole bigger) and even if you child drops it, it will have extra protection. Feel free to ask about anything that needs clarification. You can use an application to temporarily disable the touchscreen. Quick Google search resulted with https://play.google.com/store/apps/details?id=com.argotronic.touchblocker&hl=en such app for Android. You can use a toddler type case (something like this: http://www.laptopmag.com/images/wp/laptop-slideshow/269537.jpg) so that you can keep your tablet safer when you give it to your kid. Other thing is, you can show him/her how to actually use it. Both my baby cousins Skype with me when I am abroad. Before I left, I showed them how to use it, so they sit down, put the tablet with the tilt case on a flat surface and talk to me. Even if they want to move around, I told them not to pick up the tablet. Not the answer you're looking for? Browse other questions tagged technology hardware or ask your own question. Can graphic tablet/laptop combos replace pen and paper?